The action begins in early April when the wild steelhead enter the river systems from the Pacific Ocean. Steelhead fishing in Southeast Alaska is more about the quality not the quantity. The rivers are small and the numbers relatively low, however, virtually every river has a steelhead run and very few people fish these wild steelhead. This provides an opportunity to be the first person to cast a fly at some of these fish. As spring moves into summer the Pacific Salmon enter the river systems. 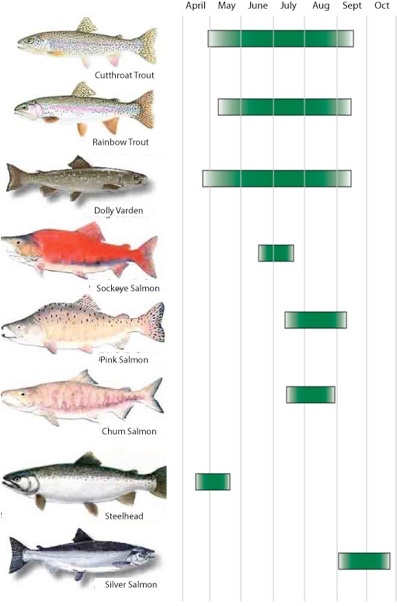 The Reds (or Sockeye) are the first salmon to enter the river systems in Late June. They are followed by the Pink (Humpy) and the Chum (Dog) runs in mid to late July. The Pink and Chum salmon runs are abundant in Southeast Alaska. The fish returns for these two species number in the millions. This provides for a great opportunity for both the novice and experienced individuals to catch multiple salmon on the fly. The highlight of the salmon run is in late summer and early fall when the Coho (Silver) Salmon enter the rivers. The late summer weather can be unpredictable, however the salmon are not. These large wild salmon are fresh from the ocean and their abundant numbers give anglers the opportunity to land multiple fish per day. These large fish will test the endurance of any angler and his 8 weight rod. Throughout the late spring and summer, cutthroat trout, rainbow trout, and dolly varden are abundant in the lakes and rivers in the Tongass. These fish don’t reach the trophy size of the rainbows in other regions of Alaska due to the smaller nature of the rivers and lakes in the Tongass. However, what they lack in size, they make up for in numbers. These species thrive throughout the Tongass region. A good day on the river will have anglers counting the number of caught and released fish in multiples of ten.